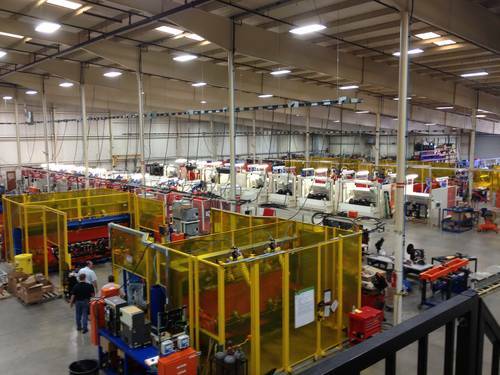 Tennessee Rand, a Lincoln Electric Company, is a full service automation integrator providing engineering, machining, and integrated robotic systems with core competencies in advanced welding system design, high-quality weld fixtures, robotic integration, process automation, and ongoing service and support. Based in a state-of-the-art 100,000 sq. ft. manufacturing facility with additional service, support, and sales offices in Mexico, we have the capability, expertise, and resources to build a broad variety of equipment ranging from dedicated welding cells to integrated in-line systems. Through our years of serving the manufacturing industry we have encountered and met an array of customer quality requirements. This varied experience along with a core dedication to customer service has developed a highly capable metrology department and weld inspection lab. We have at your disposal two large bridge-style coordinate measurement machines whose increased measuring volume allow us to inspect a wider range of products than most facilities. This, in addition to two Faro portable CMMs, gives us the ability to provide precise measuring service at our facility or yours. To further support our customers we also have full cut and etch capabilities for welded assemblies using Pax-It inspection software. Quality is not just a buzz word here at Tennessee Rand. It is the key to customer satisfaction and our future success. Read more about projects where Tennessee Rand successfully engineered, fabricated, programmed, and installed solutions that met and exceeded customer expectations.